You've finally completed your dream bedroom. You stand back, surveying all your artfully chosen pieces, from your bedding to the perfect dresser set. It's beautiful but something is missing that would take your bedroom from Pinterest pretty to Architectural Digest feature worthy. You need a luxury statement item. You need a bedroom bench. A bench? In the bedroom? A luxury bedroom bench at the foot of the bed elevates your design scheme by adding a touch of elegance to an otherwise unused space. Bedroom furniture benches are purely a design element. They are a focal point for you to showcase your style and as such, should be a fun, creative element in the room. Which bench is right for me? Fancy bedroom benches aren't the only option. There is a multitude of different utilitarian benches for bedroom use as well. For example, if you're a voracious nighttime reader, some benches function as bookcases. If you are dealing with a smaller room and need extra storage, there are hybrid designs that can be used as a hope chest as well as a step stool or extra seating. Make a statement or keep it simple – the choice is yours. Because a bench seat for bedroom décor is such a strong statement, you must be careful when choosing your style. If your bedroom has a rustic, countryside feel a stylized acrylic bench will overshadow the rest of your pieces. Unless you are hoping to achieve an eclectic, creative look, it's best to stay with patterns, shapes, and textures that coordinate with the overall feel of the space. Take your time to play with different ideas. 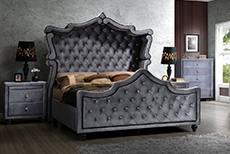 Benches for bedroom use are a glamorous addition, and the process of purchasing the right one for you should be fun. Your biggest task may very well be finding bedroom benches for sale. Because they are more of a designer touch, it can be challenging to source them in your local mom and pop furniture store. This is where 1StopBedrooms steps in to make your experience that much more comfortable. Our selection is peerless. Tall or short, velvet or wood – whatever your design style or price range, we have an impressive, comprehensive selection. Also, your finishing touch is protected with a 1-year warranty and the confidence of their exclusive price match guarantee. Been wondering what you need to make your bedroom pop? Stop wondering and enjoy their fantastic service and selection today.